Tanzania’s leading politicians – Union President Benjamin Mkapa, main opposition leader Augustine Mrema and the feuding leaders in Zanzibar – President Salmin Amour and opposition leader Seif Shariff Hamad have all had reasons for satisfaction and disappointment during the last few months of Tanzania’s rapidly developing multi-party democracy. On the mainland multi-partyism is working well; a by-election under way in Dar es Salaam will help to indicate how the main parties stand after almost a year of this new system of government. In Zanzibar, by contrast, it is becoming increasingly difficult for TA to present an accurate and unbiased report on what is happening because of the conflicting information received. The opposition continues to refuse all cooperation with the government elected under questionable circumstances last year and the ruling party is resorting to strong arm tactics in its determination to maintain law and order. Popular President Mkapa’s dominant position was consolidated on June 20 when he was elected Chairman of his Chama Cha Mapinduzi (CCM) Party by an overwhelming 1,248 votes out of 1,259 at an emotional ceremony in Dodoma. Former President and Chairman Ali Hassan Mwinyi handed over the CCM Constitution, 1995 Election Manifesto and Chairman’s gong midst deafening chants of ‘CCM’, ‘CCM’, ‘CCM’, dancing, ululation and music by the party’s cultural troop ‘TOT’. The new Chairman said that he would maintain earlier policies of socialism and self-reliance and would continue to fight tribalism, discrimination and religious bigotry. He would cleanse the party of immoral and corrupt elements and would enhance discipline, efficiency and integrity in the government and party. National Publicity Secretary: John Mgeja MP for Solwa. Mr Ngombale-Mwiru (who had been Publicity Secretary) was later appointed Minister of State in the Prime Minister’s Office and Dr. Lawrence Gama (who had been Secretary General) became Regional Commissioner, Morogoro. President Mkapa has continued to surprise people by the number of changes he is making in senior posts. On May 6 he announced the appointment of Mr Omari Iddi Mahita, the Arusha Regional Commissioner of Police as Inspector General even though Mr Mahita had previously been two ranks below. The President sacked five other top officers. On June 30 he appointed Mr Onel Malisa as the new Principal Commissioner of Prisons and retired in the public interest 15 police, prison and immigration officers. One of the reasons for President Mkapa’s popularity is the decisiveness with which his government deals with signs of bad governance. An example of this is the case of the Dar es Salaam City Council. Prime Minister Sumaye had warned the Council when he addressed them on January 4 about its low 30% collection of revenue, poor levy system, outright corruption and poor administration of the Council’s by-laws. On June 28 he announced that the Council had been dissolved and been replaced by a Commission that would run the city for one year (later changed to 10 months) while a new management structure was established. The government’s next step was to abolish regional development directorates and replace them with small secretariats to be under the Regional Commissioners. In districts also, District Commissioners would be overall supervisors of all government functions to reduce bureaucracy. But there are still remnants of the intolerance of opposition typical of earlier Tanzanian governments. When the long established Swahili biweekly ‘Heko’ published a letter claiming that there hadn’t been a proper government in Tanzania since independence it was promptly banned. Then came what could become a setback to the government’s reputation for probity. On June 30 the former Director of Intelligence and Security, Lt. General Imran Kombe, was shot dead in his car in a hail of bullets by five police detectives and a civilian who were said to have mistaken him for a notorious car thief. The owner of a similar car had offered Shs 1.5 million reward for the arrest of the thieves and recovery of the car. But, the police account of the incident differed from that of the General’s wife who was with him and had escaped. She said that her husband had stopped the car and put his hands in the air before he was shot. People began to wonder whether this was Tanzania or Kenya and what secrets the General was holding. The police were promptly arrested and charged with murder but the press became suspicious again when they were barred from the court when the police appeared before it. On July 20, under mounting pressure from press and public the government set up a high powered judicial enquiry under Justice Damian Lubuva to report within a month. The Commission immediately appealed to Britain’s Scotland Yard for assistance but this was refused. Responding to criticism the Attorney General later assured the National Assembly that there was nothing wrong in appointing the commission while murder proceedings were going on in court. The Commission’s proceedings would be in camera. Meanwhile, the Chairman of the NCCR-Mageuzi Party, Augustine Mrema, has been busy setting up a strong nationwide party apparatus. Somewhat reluctantly his party has set up a system similar to the 10-cell CCM party system believing that this is the only way to counter CCM’s strong grass roots organisation. The blue flag of the NCCR can now be seen flying in villages from end to end of the country – almost as many as the green flags of the CCM. And Mrema himself has bravely taken on a major political risk by putting himself up as candidate in a by-election which few believe he can win. Mrema had earlier accused CCM of being a sick administration suffering from ‘Acquired Anti-Democracy Syndrome’ (AADS). A petition filed by two defeated candidates (from NCCR-Mageuzi and CHADEMA) in the Temeke (Dar es Salaam) parliamentary constituency occupied several weeks of High Court time. The case revealed much of what was alleged to have happened in at least one Dar es Salaam constituency during the last elections and resulted in the convening of the first byelection of the new parliament. Lamwai: You say you graduated from the Dar es Salaam Technical College in 1986. Is that right?. Lamwai: Do you know that man? (pointing to former Technical College Students Council Chairman)? Kihiyo: No, I don’t know him. Lamwai: What is a foundry? Kihiyo: I don’t know (laughter from the packed public gallery). Lamwai: How many sub-departments are there in the Mechanical Department of the College? Kihiyo: An engine room, an injection pump and repair (laughter). Lamwai: Do you have any paper indicating what marks you got? Kihiyo: I think I have it somewhere. Lamwai: Do you know who the Principal of the College was when you were there? Lamwai: Who was the Registrar? Lamwai: No. Mr Kuhanga was my Vice-Chancellor at the University of Dar es Salaam at that time. Lamwai: When did you start your studies there? Dr. Lamwai told the court that Kihiyo had used the title engineer during the campaign in relation to his ability to solve water problems affecting the constituency. The Judge asked Kihiyo to bring his certificate to court. Kihiyo: (Next day). Your Honour, can you please give me two more days to look for the document. Lamwai: Do you still maintain that you graduated from the College? Dr. Lamwai then asked about the stream he had been in, his Head of Department’s name, who had presented the certificate to him, what were the entrance requirements but in every case Kihiyo either did not know or gave the wrong answer. Lamwai: What does VTC stand for? Kihiyo: It is National Committee Centre (laughter). On May 29, following a month in the High Court, Mr Kihiyo announced through his counsel that he had written to the House of Assembly Speaker resigning as MP for Temeke on medical grounds. On June 26 in the National Assembly Mr Christiant Mzindakaya (CCM MP for Kwela) said that Dr. Lamwai was a ‘bad comrade’. He was bent on unseating his fellow MP’s rather than using his talents to defend them (loud laughter). Satirist Wilson Kaigarula in the Daily News wrote about a friend of his Uncle Tamaa who had been hovering about the disbanded Dar es Salaam City Council trying to get a job as Garbage Collector-in-Chief. He swore before the God of the Vingunguti dump yard that, if offered the job, he would make the City as clean as Paris. He said that the scientific exposure he had received at the Municipal Sanitation Technical College in the Kalahari desert would ensure that he could do the job! The by-election in Temeke, which is under way as this issue of TA goes to press, has attracted intense interest because NCCR leader and presidential candidate last year Mr. Augustine Mrema, who was also Deputy Prime Minister in the previous government, decided to take a great risk by putting himself forward as the candidate of his party. Few observers believe he can win. He is a Chagga fighting an election a long way from his power base in Moshi and standing against a local man, Mr Abdul Cisco Ntiro who represents CCM. He is a Christian in a predominantly Muslim constituency and has had difficult relations in the past when Muslim fundamentalists started attacking pork butchers’ shops and he had to bring the full force of the law down against them. The opposition vote is badly divided with possibly 11 other candidates. One of these is the previous NCCR candidate who was so bitter at his removal as candidate that he joined CUF and now campaigns against Mrema. The date of the by-election is October 6. Another electoral petition involving 45 prosecution witnesses against the election of CCM House Speaker Pius Msekwa in Ukererewe and a petition against NCCR-Mageuzi MP for Arusha, Mr Charles Makongoro Nyerere (the son of Mwalimu Nyerere) failed in the High Court. A hotly contested electoral petition began in Bunda, Mara Region, where NCCR MP Stephen Wassira had beaten former CCM Prime Minister by a wafer thin majority of votes; there was much debate on whether Wassira had bribed voters with offers of sugar, salt and meat. At one stage in this case Judge Kahwa Lukingira ordered the former election supervisor for the constituency to appear before the court immediately. Told by the State Attorney that the supervisor was on tour with the Regional Commissioner, the judge asked if this meant that he had disregarded the on-going court session; had he opted to loiter with the RC? ; other witnesses had come from as far away as Mtwara, Dar es Salaam and Mwanza. In Zanzibar the High Court dismissed four election petitions contesting the election of CCM MP’s in Unguja on the grounds that, under the 1990 Elections Act, membership of the Isles House of Representatives could not be challenged without the consent of the Attorney General – this had not been obtained by the CUF petitioners. There is no problem in Zanzibar, only a few individual trouble makers, according to Zanzibar President Dr. Salmin Amour. Many observers question this interpretation of the situation (see TA No. 54). As far as can be ascertained by trying to sift fact from rumour or propaganda it appears that positions have hardened in Zanzibar during recent months. Tanzania is blessed with a remarkably free press and the following attempt to explain what has happened recently is largely derived from items already published in Tanzania’s press. As the ruling CCM has the support of only half the population, there is a long history of political division in the islands and the word ‘compromise’ is as popular amongst leaders in Zanzibar as it is amongst those in Northern Ireland, President Amour’s CCM government has taken to strong arm tactics to try and control the situation. The President does not conceal his determination to deal with dissidents – see below. The leader of the opposition Civic United Front (CUF) Seif Shariff has reacted by stepping up his relentless local and international campaign to denigrate the President – saying that he was not properly elected – and criticising the injustices which he claims are occurring regularly in the Isles. There is no longer very much doubt that there have been cases of infringement of the human rights of opposition supporting Zanzibar citizens, particularly those from Pemba (where people voted overwhelmingly for the opposition in the elections) but it is very difficult to get at the whole truth. Many people have been beaten up by the police; some Pemban born staff in the civil service have lost their jobs; hundreds of houses have been demolished; CUF is not allowed to hold meetings in Unguja – the latest one to be cancelled ‘for security reasons’ was on August 3. Visitors to Zanzibar come away with mixed impressions. Tourists find Zanzibar very attractive; they meet warm and friendly people. There is an atmosphere of peace and tranquillity. Few tourists know that there might be something amiss in the islands. Many (but not all) Dar es Salaam and foreign newspapers can be bought freely. Opposition supporters seem to be free to talk to strangers. But other visitors, who perhaps dig more deeply, speak of an atmosphere of fear. An example of an incident in which it is difficult to obtain a clear picture is the case of the Zanzibar citizens who are said to have started to destroy their own homes in the middle of the rainy season this year and made themselves homeless. According to reports, on April 14, the government issued an eviction notice to all houses within a densely populated area of Mtoni in Unguja. The occupants had to move as their houses would be destroyed within seven days. Few heeded the warning. A week later a government bulldozer and a force of fifty police began the task by force. The bulldozer started by flattening concrete block houses – these were not temporary shacks. It worked. People rapidly began destroying their own houses trying to rescue doors, windows and roofing materials. The affected area contained hundreds of houses and many thousands of people of whom a large number are alleged (by some) to be immigrants from Pemba. The evictions apparently arose from an incident at the main power station on April 1 which denied electricity to the whole of Zanzibar for four days. The eviction order was issued the day the power was restored. The government says that the power station was sabotaged by opposition party supporters. Others maintain that the explosion was an accident caused by a chronic failure to maintain the plant properly. CUF claims that the government sabotaged the installation to raise the political tension and thus show that the CUF comprises anti-democratic troublemakers. The official statement on the destruction of the houses says that the houses were dangerously situated under high voltage cables and that people had occupied the land illegally. President Amour, in a ‘victory’ speech after returning from the Dodoma party conference, where the CCM had given him total support, he said (according to the Dar es Salaam Guardian) that with this reinforced support the Zanzibar government would be able to deal with all who flouted its authority. He would use all legal instruments enacted over the 30-year period of the Zanzibar revolution to achieve this. He attacked news media for portraying his image negatively. Members of the opposition had been going to Dar es Salaam to give false information – but to no avail. “The mainlanders are in agreement with their fellow Zanzibaris to defend their unity” he said. No government could be overturned by a newspaper. “Even if they insult me, shelve me or otherwise, I will remain the same President and I will pay no heed to their insults because I am President by the electorate’s mandate”. People should start to dwell on development issues instead, he said. Reacting to an appeal for him to lift the ban he had placed on the Dar es Salaam newspaper ‘Majira’ he said that if the paper would refrain from reporting ‘half-cooked and concocted stories’ on Zanzibar he would lift the ban. He would ban any newspaper, even those owned by CCM, which tampered with Zanzibar’s rule of law, he said. The government has justified its strong-arm tactics in Zanzibar because it says that CUF has been responsible for over 40 criminal acts. As long ago as March, President Amour had said that he would not agree to mediation with the opposition Civic United Front (CUF) which refuses to recognise Amour’s presidency and demands new elections, even if the arbiter was Father of the Nation Mwalimu Nyerere himself. When Nyerere was asked recently why he didn’t do something about the crisis in Zanzibar he replied that nobody in the Union or Zanzibar governments had asked him to do so. Addressing 14 members of the mainland press visiting Zanzibar on May 27 Dr. Amour (as reported in the Daily News) denied that his government was abusing human rights by harassing and imprisoning people from Pemba. Zanzibar’s prisons had only 92 inmates and remandees. One of the visitors subsequently wrote an article under the heading ,Zanzibar, where fear reigns1 in the Business Times (May 31). The writer said that on one occasion, when the bus full of journalists stopped at a village in Pemba, children playing football all ran away ‘with terror on their faces1. It was explained that the children had thought that the journalists were police or government officials. According to Radio Tanzania Zanzibar, quoted in the Daily News on June 12 a Mr Hassan Khamis had been jailed in Pemba for six months for defaming President Amour. The Magistrate said that this sentence would serve as a deterrent to other people. For several months after the elections President Mkapa made no comment on the situation in Zanzibar other than that he had no constitutional power to intervene. However, during a visit to Zanzibar starting on April 21 he made what the East African referred to in a leading article as a ‘wrong move1. It wrote: ‘Finally President Mkapa has spoken (about Zanzibar) but many Tanzanians wish that he hadn’t1. His words were unexpectedly harsh. Ruling out cooperation with the CUF he had accused it of using democracy to disrupt peace; rather than restrain Amour he would prefer to control the CUF; as for donor’s protests, most of them knew the opposition was causing civil disobedience and sabotage and their statements were ‘geared towards drawing the country into civil war’. President Mkapa had clearly thrown his weight behind force rather than diplomacy the article concluded. Some observers noted however that, under a recent amendment to the constitution, President Amour is a member of the Union cabinet and, in that sense, President Mkapa has to live with him. Another newspaper noted that President Mkapa was, at the time, facing an election for the Chairmanship of the CCM party and needed Zanzibar CCM votes if his mandate as President of the United Republic was to be convincing. Into the midst of this unpromising situation Commonwealth Secretary General Chief Emeka Anyaoku decided to try his hand. After very extensive discussions indeed in the first week of August (he met all the key people in Zanzibar and on the mainland; he had seven meetings with CUF) the Daily News quoted him in an article under the heading ‘Club Chief sees end to Isles Stalemate’ as saying that he was ‘positive that the wrangling political parties would find a common stand and bring an end to the political stalemate on the islands’. Both leaders were said to have made him believe that a new chapter of cooperation would soon be opened. CUF Secretary General Shabaan Mloo said that CUF had been deeply moved by Chief Anyaoku’s admission that there was political tension in the Isles. The Chief had said that he was concerned about the situation because it implied that multiparty democracy was not normal in Zanzibar. CUF was ready to meet the CCM for unconditional talks. Because the first step had been reached by establishing that there was a problem in Zanzibar, CUF believed that efforts by the Commonwealth might succeed in tackling the problem. He was under the impression that there might be a follow up mission by Commonwealth officials. As we went to press, however Dr. Amour had made no comment. It is understood that the Commonwealth Secretary General made certain proposals and that these were being considered in Zanzibar. In his departure statement Chief Anyaoku said that he was very hopeful that a new page of cooperation in the politics of Zanzibar would soon be opened. ‘Tanzanophiles’ will add their hopes to his. Foreign Minister Jakaya Kikwete, on return from a nine nation tour of Europe on May 20 said that the donor community recognised President Salmin Amour’s government but had expressed reservations about human rights in the islands. Norway has granted Tanzania $3.7 million as a sign of goodwill towards the new Tanzanian government but it stated that it was not prepared to consider aid for new developments in Zanzibar. The Swedish Director of the East African region of SIDA was quoted as saying that the problem of Zanzibar was ‘dragging Tanzania backwards’. According to the East African, international donors have decided to maintain the ban on aid to the Isles while releasing increased funds for the mainland. The Business Times reports that in Finland both the ruling CCM and the CUF are considered to be to blame for the political instability. The Finnish Ambassador said that Zanzibaris needed to agree to disagree, using the parliamentary forum, and to begin to address other critical aspects of peoples’ welfare. Tanzania’s Finance Minister, Professor Simon Mbilinyi, said in his budget speech on June 20 that government would spend Shs 758,896 million in 1996/97 compared with estimates of Shs 631,906 million in the previous year – an increase of 20.8%. Government would collect Shs 550,192 million domestic revenue; the balance of Shs 208,704 million would be raised through a series of sources which included foreign loans and grants (Shs 187,537 million – an optimistic figure, non-bank borrowing (Shs 24,256 million), additional revenue from taxes and nontax revenue (Shs 13,563 million). There are no plans for ‘bank borrowing’ which is really equivalent to printing money. He said that he had two main aims in his 1996/97 budget – to broaden the tax base and to protect local industries. Shs 40 out of every Shs 100 of expenditure was to service foreign debt amounting to seven billion dollars. This would mean shedding 200 out of 1,500 development projects. Earlier, Planning Minister of State Daniel Yona had stated that he was optimistic about restoring macro-economic stability by lowering the rate of inflation from 23.5% to below 10% within two years; exports had gone up from $519 million to $683 million last year but the government had had to borrow Shs 86.4 billion compared with Shs 56.8 billion the previous year to finance the budget deficit. The budget was criticised by many in the business community which had itself prepared detailed budget proposals for the Minister’s consideration. They had proposed doing away with a myriad of taxes which cost more to administer than the benefit they brought; to introduce punitive measures for those breaking the law; give an amnesty for earlier defaulters because their cases could clog up the courts for years and cause yet more corruption; and encourage by tax incentive new investment in priority areas. The Business Times expressed the disappointment of the business community – ‘the difference between this budget and past budgets is that the business community was interested in what the Minister of Finance was going to say. This was the first time that there was a government which actually meant it when it said that it wanted to fight corruption, encourage the free market and the private sector. In the past Ministers of Finance had pretended that they were administering a budget and businessmen had pretended to pay their dues. But this budget was too conservative, designed primarily to appease the IMF and World Bank and lacked incentive for investors. At the Consultative Group meeting in Paris in late July donor nations pledged about $1.2 billion in aid ($200 million more than originally planned) of which about $560 million could be made available during 19976/77. Delegates welcomed the progress that had been made during the second half of the 1996 financial year with structural reforms and the start made in restoring fiscal stability. But there was some ambiguity in the statement made at the end of the meeting. Specific conditions were laid down before the aid could start being disbursed. These included sustaining macro-economic and fiscal stability, further progress in reform and measurable improvements in governance (presumably in Zanzibar). A particularly contentious issue was the liberalisation and privatisation of the utility companies. 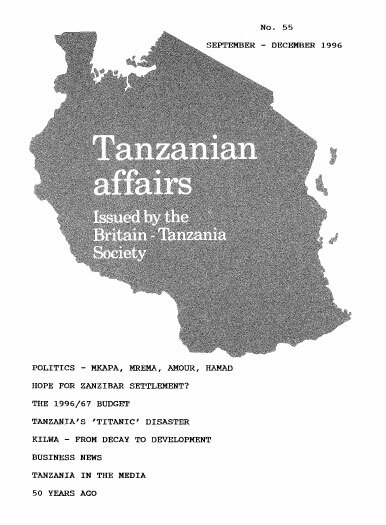 A conference (with almost 200 participants) entitled ‘Africa’s Urban Past’ at the London School of Oriental and African Studies (SOAS) from June 19 to 21 1966 was not without pungent expressions of opinion about various aspects of the Tanzanian (or Tanganyikan) experience of urban development. Thomas Spear of the University of Wisconsin-Madison in his paper (TOWN AND COUNTRY: ARUSHA AND ITS HINTERLAND) described Arusha’s history in some detail: from its original establishment by the Maasai in the 1830’s’ through its function as the last stop for caravans in the 1860’s; the erection of the ‘boma’ by the Germans (‘it was meant to impress – it even had electricity’); and the British notion of Arusha as a ‘garden centre’ with its carefully segregated high, medium and low density residential areas; ‘the Europeans lived above and to windward of the Africans’; land was ‘seized from the African population for golf courses, tennis courts and other European social amenities’. Throughout it all the town remained resolutely divorced from its hinterland and was populated by ‘strangers’ – Colonial officers, European shop keepers, settlers, Indian merchants, Chagga, Pare, Somali and Swahili traders – relentlessly expanding at the Arusha farmers’ expense. In what turned out to be a controversial paper (‘A HEAP OF HUTS? VUGHA AND THE NATURE OF THE KILINDI STATE) Justin Willis of the British Institute in Eastern Africa spoke about the ‘Shambaa Kingdom’, a pre-colonial polity in what is now north-eastern Tanzania. The residence of the hereditary rulers, from the Kilindi clan, was at Vugha, in the mountains of Western Usambaa; when first visited by European observers in the mid-nineteenth century, Vugha, with perhaps 3,000 inhabitants, represented an unusual concentration of population for the region. The object of Willis’ paper was to argue that the presence of such a settlement close to the normal residence of the ruler, led European observers to make certain assumptions about the Kilindi state which were mistaken. Burton had described it as a ‘heap of huts’. 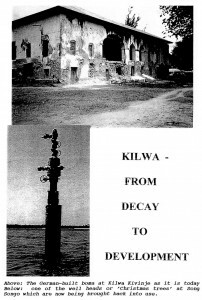 Kilindi had not been a centralised polity; Vugha was not the capital of the state; nor was it even a single settlement. When Britain took over responsibility for Tanganyika from the Germans in 1919 they inherited in Dar es Salaam a situation of urban lawlessness amongst the 20,000 African population said Andrew Burton of SOAS in his paper CRIME AND COLONIAL ORDER IN DAR ES SALAAM, 1918-39. The behavioural constraints of the ‘tribal society’ no longer applied in the multi-ethnic urban environment and this lack of constraints resulted in the emergence of that bogeyman of colonial society, the ‘detribalised African’, he said. A prominent area in which colonial law clashed with African notions of legitimacy were the regulations controlling the production and consumption of alcohol. Liquor laws were rigidly enforced – they helped to reduce drunkenness and increased the reliability of the African worker. Prostitution was considered legitimate not only by the African population but also, effectively by the state; laws prohibiting it were not implemented. The paper by William Bissell of the University of Chicago (CONSERVATION AND THE COLONIAL PAST: URBAN PLANNING, LAW AND POWER IN ZANZIBAR) consisted of a rather intemperate attack on the five urban planning documents produced there since 1919 which, the author said, had remained unimplemented. Whatever the political jurisdiction, officials had ‘repeatedly demonstrated an almost unshakable faith in the ability of a comprehensive town plan to solve all problems … the immense disparity between the bureaucratic resources, time and energy devoted to planning and its meagre results might seem astounding … but in the colonial milieu plan-making and inertia were not opposed activities, indeed they directly implied and depended upon each other. The author went on to put the knife into colonialism – ‘parts of the plans which were actually built invariably related to the colonial economy – improvement of traffic networks and transport or port rehabilitation. At least until the revolution, pressing social needs like housing, which were often put forward as the raison d’etre of the plans, were continually postponed …… What Zanzibar reflects is the degree to-which legal contradiction, bureaucratic ineptness, official obfuscation. prolonged inaction and petty adherence to formality – all reinforced by a total lack of accountability – were powerful tools of colonial power…. The fact that this was unintentional makes it no less powerful’ – DRB. Tanzania has the largest tsetse mass-rearing facility in Africa and the largest tsetse colony of over 600,000 female flies – the largest in the world, according to Director General of the International Atomic Energy Agency, Dr. Hans Blix, quoted in the Daily News. Although tsetse flies were a menace to the health of people and livestock, he said, still there was a need to reproduce them en masse. The flies are reared at the Tanga-based Tsetse and Trypanosomiasis Research Institute and the male flies are made sterile using gamma radiation from cobalt 60 or caesium 137 sources before their release in tsetse affected areas. Tanzania was said to be in a leadership position and could soon begin exporting flies which would help to decimate tsetse populations in other countries. Dr. Blix inaugurated a third insect rearing facility at Tanga during his visit to Tanzania. The British Council’s ACTION IN AFRICA newsletter (June 1996) reported that two eminent land lawyers, Charles Harpum, a member of the Law Commission of England and Wales and Malcolm Grant, Professor of Land Economy at Cambridge University, were in Tanzania recently. They contributed to a workshop organised by the Ministry of Lands for lawyers scrutinising the draft land law legislation for consistency with the published National Land Policy before its presentation to Parliament later this year. The same newsletter reported that the Council had hosted a presentation of the film ‘Towards Good Government: Records Management and Public Sector Reform in Tanzania’ to an invited audience of Principal Secretaries in the Civil Service and members of the Cabinet Secretariat. The film was made by the International Records Management Trust as one of the outputs of a workshop to restore order to the Tanzania National Archives which took place last year. The Ministry of Education has invited archives personnel to appraise records and reorganise its congested registry. This is how Mark Besire in the EAST AFRICAN (May 6-12) described a cultural renaissance now happening amongst the Sukuma. The centre of this rebirth was the Sukuma Museum, a ‘living museum’, at Kisesa 24 kms north of Mwanza which was being assisted by several donors including the Dartington Trust in Britain. New chiefs were being installed and others reinstalled. Many were collecting and researching shitogeljo – objects that played a significant role in traditional ceremonies. Some chiefdoms were returning to matrilineal succession as practised before the colonial period. The institution of chiefs was abolished at independence. But many chiefs were now taking active roles in their communities, more people were turning to traditional healers and there was great zest for traditional dance competitions. A note of alarm was signalled in an article about a well-known Tanzanian tree in BBC MUSIC MAGAZINE in August 1996. It stated that, unless action is taken, harvestable stocks of the African Blackwood or ‘Mpingo’ tree which is used to make clarinets and oboes, the chinrests of violins and the wooden part of bagpipes – plus Makonde wood carvings, could run out within 30 years. An expedition from Cambridge University has gone to Tanzania this summer to get data to help the Flora preservation Society draw up a conservation plan for Mpingo. (Thank you Jane Carroll for finding this item. More on this subject in Readers Letters below – Editor). The Bellagio Network Newsletter No 16 (Spring 1996) contained an article about the Pemba Public Library by Margaret Ling, Director of the Zimbabwe International Book Fair, Although the need for a library had been established 40 years earlier this one finally opened in 1994. Its initial stocking was helped by the British ODA and Council and there are now some 1,500 regular users of the 13,000 titles. Of these only 2% are from African publishers and Pemba, like 85 of the 104 districts in Tanzania, does not yet have a bookshop. (Thank you Pru Watts-Russel for this item – Editor). GUARDIAN EDUCATION (March 12) revealed that the Leeds Development Education Centre (Tel: 0113 278 4030) has designed an interactive CD-Rom and accompanying teacher’s pack and video about a Tanzanian woman and her family for key stages 1 to 3 in schools. The cost is £49. According to the March/April issue of AFRICA – ENVIRONMENT AND WILDLIFE, a small chameleon spotted in the Mkomazi Game Reserve late in 1994 by entomologist Tony Russell-Smith has turned out to be a big zoological find. This was the first African pygmy chameleon seen by Dr. Malcolm Coe, leader of the Mkomazi Ecological Research Programme, in 40 years of studying savanna ecology. But Rhampholian kerstenti is a familiar sight in the coastal forests and in the Usambara and Pare mountains. The hills of Mkomazi are relatively undisturbed, offering what may in the future be a critical refuge for these eight centimetre-long reptiles. This is how the EAST AFRICAN described Mbaraka Mwinshehe Mwaruka on what would have been his 52nd birthday. He died in 1979 aged 35. ‘He was a singer, guitarist, performer and composer – East Africa’s most prolific all-round pop musician’, the article said. ‘Although he said that he only wanted to sing and dance he was an amalgamation of different things to different people – a poet to some; to his family a cutting satirist; to the country’s politicians a lavish praise singer; to the nation, a musical ambassador (he was with the famous Morogoro Jazz Band at the Expo ’70 Exhibition in Japan and later formed his own band, Orchestra Super Volcano); he was a witty social commentator in the East African oral tradition’. A commemoration was held at the newly opened FM Club in Kinondoni on January 12 this year. Herald Tagama of Gemini News writing in the Uganda MONITOR (May 6-7) featured the revived debate in Tanzania about the language to be used in schools. The Chairman of the National Swahili Council, Prof. Herman Mwansoko, was quoted as having started the debate by leading a delegation to President Mkapa to press for a ban on English in all subjects in schools from primary level to university. President Mkapa deflected the proposal but said it was worth debating. And a debate began. Particularly vociferous were those parents who send their children to Kenya and Malawi to avoid declining standards in Tanzanian schools. Tony Ngaiza, the editor of Majira attacked this ‘fanciful’ proposal and accused the Kiswahili Council of frivolity when the quality of education was nose-diving. Mwansoko returned to the fray, calling the objectors ‘colonial minded’. Others noted that European countries had no difficulty in continuing to use their local languages in schools and also learning English. Eventually Mwalimu Nyerere, who had made Swahili the medium of instruction in primary schools so that he could put his message across to ALL the people, said that “What we have done for Swahili is enough. Now we have to give English its vim. It is the ‘Kiswahili’ of the world”. This, according to British TV personality Jeremy Paxman is what you always hear when you go on a fishing holiday. But, according to the WEEKEND GUARDIAN (January 27) when he went fishing at the Pemba Channel Fishing Club on the Kenya/Tanzania border he was greeted with the unprecedented words “You are going to catch fish. We’re having the best season for years”. Marlin fishing, Paxman wrote, is the macho end of angling – it is to fly fishing what arm wrestling is to chess. ‘The longer the search went on the more I began to dread what would happen if and when we found one. Then suddenly complete commotion… when the fight began it was every bit as exhausting as I’d feared. The fish tore off 400 yards of line and then leapt from the water… within five minutes I was soaked in perspiration and had lost most of the skin from my index finger. In 10 minutes my left arm was aching as if it couldn’t move any more. It took about 15 minutes. “Do you want to kill him?” the boatman asked. I couldn’t see the point and so we tagged him in the hope that the next time his aggression led him to attack a bait, the boatman might think it worth $5 to send back the tag and we’d learn a bit about how these beautiful fish migrate around the world’. The EAST AFRICAN (June 17-23) reported that the government had suspended the registration of new NGO’s (non-government organisations) until September pending amendment of the 1953 Association Ordinance that governs the operations of such bodies. Each of the 850 NGO’s registered in Tanzania since 1953 would be examined amid rising suspicions that many were not following the law. WORLD BANK NEWS (August 1) announced that $77.6 million $35 million from IDA is being invested in a project designed to conserve the lake’s biodiverity and genetic resources, control the water hyacinth, generate food and provide jobs and safe water in a disease-free environment. VSO’s quarterly magazine ORBIT (No. 61) reported what it described as an unwelcome jolt. Volunteer Jennifer Semahimbo, who had married a Tanzanian while in the country, was refused social security benefits on her return to pending ‘reestablishment of her habitual residence’ even though she had kept her home in Birmingham and VS0 had paid her national insurance contributions. The Department of Social Security claimed that a Tanzanian tax clearance certificate in her passport indicated residence there. The EAST AFRICAN (August 19-25) reported that Tanzania has inaugurated its own Tea Research Institute in an effort to reverse the decline in the country’s tea production. Malawi was said to have the same acreage under tea as Tanzania but produced twice as much tea. World Bank Resident Representative in Tanzania Ronald Brigish told a press conference in May that while the GDP GROWTH in Sub-Saharan Africa averaged 3%, Tanzania was now growing at a rate of 4% p.a. Tanzania had bright prospects and could register economic growth of even 10% like Uganda. The country’s POVERTY was exaggerated, he said. He thought that Tanzanians were probably consuming more than twice the official GDP per capita of $120 p.a. and that the difference was caused because figures for the informal sector, small scale mining and trade were not included in official statistics – Daily News. Exchange controls by the Central Bank of Tanzania have been removed on the strong recommendation of the IMF. Restrictions on payments and transfers of money whether they be for imports, education, transport, travel or repatriation of investment income were officially removed on July 15 but many observers reacted with caution to the move wondering whether it was in the best interests of the country – East African. The National Assembly ratified on April 24 a 1994 agreement between Tanzania and Britain which gives FAVOURED STATUS to investors from the two countries. The agreement enables the aggrieved party in the case of nationalisation to refer the dispute to the International Centre for Settlement of Investment Disputes or to a special joint arbitration tribunal in the case of other disputes – Daily News. A USAID STUDY has singled out antiquated socialist-era laws still on the statute book as major impediments to investment. Reference was made to the legal monopoly in grain marketing of the National Milling Corporation even though the government had liberalised marketing through executive directives; these could be contested in court. The stagnation in coffee production was partly due to the Nationalisation Act of 1973 which gave the government powers to seize commercial farms of over 50 acres. Such old laws should be repealed to encourage investors – Business Times. The new TANZANIA REVENUE AUTHORITY started work on July first. Its Commissioner General is Mr Melickzedec Senare. It is the only body authorised to recommend tax exemptions to the Treasury and is empowered to attach property for auctioning without reference to the courts. It has received a grant of $2.5 million from the USA, $0.49 million from the World Bank and 2.7 million Kroners from Denmark to help with start up costs. The UK firm Coopers and Lybrand assisted it in drawing up its staff scheme of service and remuneration package. World Bank funds are being used for communication equipment to enable it to communicate with all customs posts in the country. At the inaugural ceremony President Mkapa instructed the authority to raise tax collection to an internationally comparable percentage of the GDP. He said that in Tanzania it was only 14.6% compared with 23% in Kenya, 32% in Zimbabwe and 45% in the European Union – Daily and Sunday News. A 10,000-line computerised DIGITAL TELEPHONE SYSTEM which identifies both fake and genuine subscribers has been installed in Dar es Salaam – Business Times. The leasing of the SA0 HILLS SAWMILL to a Norwegian company at $198,000 p.a. on May 15 is expected to boost the country’s dwindling wood industry. Nortan AS will pump in $3.4 million for rehabilitation. The parastatal Tanzania Wood Industries Corporation’s (TAWICO) output declined from 21,419 cu.m. in 1991 to 8,515 cu.m. in 1994 and profits turned into losses. The company’s nine other subsidiary companies are to be privatised – East African. Tanzania has jumped from 16th to 7th position among 20 African countries with the highest income from TOURISM – from 1.3% in 1993 to 2.3% of African tourism revenue in 1994. South Africa, Tunisia and Morocco lead the list – Business Times. Locally made WINE has virtually disappeared from the market because of the collapse of the Dodoma Wine Company (DOWICO)> The company, which produced a million litres in 1983, has stopped purchasing grapes because of liquidity problems – Business Times. A Tanzanian company, Superdoll Trailer Manufacturers (STM), has won the International Africa Award which is awarded each year by ‘Editorial’ an international publishing company to companies which produce high quality products and provide good service. Almost 50 companies were represented at the award ceremony in Senegal – Business Times. CASHEWNUT PRODUCTION has increased dramatically from 17,059 tons in 1990 to 81,000 tons in the 1995/96 season. Farmers are now using sulphur pesticide and improved seeds under the Cashewnut Improvement Programme (CIP) – Daily News. At a meeting convened on June 18 for the 1,000 strong ‘Tanzania Shop Owners Association1 addressed by the Commissioner of Income Tax, which was designed to allay their FEARS OF THE NEW REVENUE AUTHORITY, less than 50 people turned up; none were from the large Tanzanian Asian membership – Business Times. At a meeting of the ‘Tanzania-UK Business Group’ in London on July 22 Director General of the Investment Promotion Centre Samuel Sitta revealed that an INVESTORS FORUM was being planned for November 5 to 8 at the Sheraton Hotel, Dar es Salaam; he admitted that the ‘One Stop Investment Centre’ had not yet become a reality but hoped that improved and accelerated procedures for investors would be announced at the conference (Thank you Ron Fennel1 for this item – Ed). The start of work on prospecting for what is expected to be one of the biggest GOLD MINES in the world in Shinyanga Region is being held up by the need to evict 7,000 illegal miners. They will be relocated to other areas. The company has already spent $3.8 million in initial work in the area – East African. The Kuwait Fund has agreed to finance a $13.8 million TELECOMMUNICATIONS NETWORK in Zanzibar to be installed by the Tanzania Telecommunications Company and Ericsson AB (Sweden) within 16 months. The COOPERATIVE AND RURAL DEVELOPMENT BANK (CRDB) was privatised in July. It is now owned by 10,000 individuals, cooperative unions and private companies, each limited to not more than 5% of the shares plus the Danish International Agency (DANIDA) which has 30%. They jointly raised $3.4 million to buy the bank – East African.